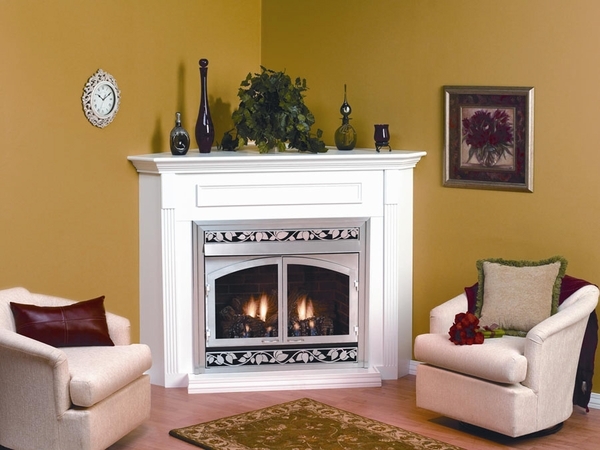 Corner Depth - 43 5/8"
* Please Note: Shown With White Finish And A Separately Purchased Fireplace. This corner piece is sized to receive a 32 Breckenridge Premium or Select firebox with no adjustments required. Assembled with care using cabinetry grade wood and hand finished, this mantel cabinet and attached base will decorate your firebox with the same quality level as a professionally custom built cabinet. Also offered in a dark oak or cherry finish, this mantel features a white finish that is durable as well as attractive. Tailored to the size and design of Empire's 32 inch Breckenridge fireboxes for quick installation. Do you have to remove base boards for this to be installed? The bottom edges of this corner mantel were not designed with any "universal cutouts" for baseboards. The simplest solution, where baseboards already exist, would likely be to cut the baseboards to terminate flush with the edge of the unit.